The American Cancer Society estimates that in 2016 about 48,330 people will get oral cavity or oropharyngeal cancer, and an estimated 9,570 people will die of these cancers. These cancers are more than twice as common in men as in women. They are about equally common in blacks and in whites. The death rate for these cancers has been decreasing over the last 30 years. These statistics suggest that oral cancer death rates are higher than those from Hodgkin lymphoma, laryngeal cancer, cancer of the testes, and endocrine system cancers such as thyroid and skin cancer (eg, malignant melanoma). The incidence or oral cancer also appears to be significantly different based on race and other confounders such as smoking, and alcohol consumption. Given the prevalence of these behaviors in the World, the WHO and the 58th World Health Assembly Resolution on Cancer Prevention and Control has urged Member States to develop and reinforce cancer control programs to prioritize tumors and risk factors. Age is another confounder of oral cancer risk. The most common oral cancer is squamous cell carcinoma (see image below). Other less common cancers occurring intraorally include adenocarcinoma, Kaposi sarcoma, and melanoma. 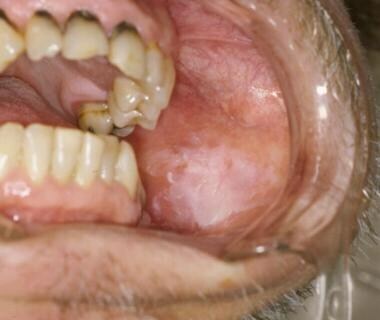 This image depicts reddening of the soft palate, perhaps with scattered areas of white and velvet red patches; tobacco-induced squamous cell carcinoma involving the tongue base and/or supraglottis; and a firm, mobile mass that is palpable at the left carotid bifurcation. One explanation for the high death rate is that oral cancer may not be readily identified until it has metastasized because of its location. This may, in part, be because oral cancer is often painless initially (until it invades the deeper tissues) and thus goes unnoticed by the patient. Of course, prognosis is much worse when undetected disease has spread to the neck lymph nodes. Not only is the primary tumor detection an issue, but in the patient with primary oral cancer, a higher risk exists for the development of undetected secondary lesions. The oral cavity (see image below) is oval shaped and is separated into the oral vestibule and the oral cavity proper. It is bound by the lips anteriorly, the cheeks laterally, the floor of the mouth inferiorly, the oropharynx posteriorly, and the palate superiorly. The oropharynx begins superiorly at the junction between the hard palate and the soft palate, and inferiorly behind the circumvallate papillae of the tongue. The bony base of the oral cavity is represented by the maxillary and mandibular bones. The oral cavity includes the lips, gingivae, retromolar trigone, teeth, hard palate, cheek mucosa, mobile tongue, and floor of the mouth. Schematic representation of oral cavity and floor of mouth. 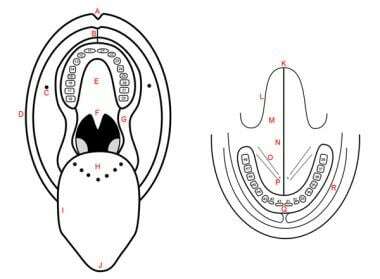 A: philtrum; B: upper labial frenulum; C: opening of Stensen's duct; D: labial commissure; E: hard palate; F: soft palate; G: intermaxillary commissure; H: base of tongue; I: lateral border of tongue, dorsal view; J: tip of tongue, dorsal view; K: tip of tongue, ventral view; L: lateral border of tongue, ventral view; M: ventral surface of tongue; N: lingual frenulum; O: floor of mouth; P: opening of Wharton's duct; Q: vestibular gingiva; R: vestibule. Teeth are numbered according to international classification. The tongue is basically a mass of muscle that is almost completely covered by a mucous membrane. From anterior to posterior, the tongue has 3 surfaces: tip, body, and base. The tip is the highly mobile, pointed anterior portion of the tongue. Posterior to the tip lies the body of the tongue, which has dorsal (superior) and ventral (inferior) surfaces. For more information about the relevant anatomy, see Mouth Anatomy and Tongue Anatomy. The etiology of oral cancer, and particularly squamous cell carcinoma, is multifactorial, with the published research suggesting that exposure to tobacco and alcohol coupled with genetic predisposition are major contributors to the disease. The combination of smoking and alcohol seems to present the greatest risk for patients. Other factors that are considered potentially causative or at least confounding in some cases include virus, diet, radiation exposure, immunocompetence, and even mouthwash. The Oral Cancer Foundation provides a good overview of the state of the science with respect to oral cancer risk factors. Oral cancer screening should include assessment of these factors by way of the verbal or self reported written history. In terms of the type of smoking habit pursued, some evidence exists that cancer risk may be higher for individuals using cigars or pipes. Data does not seem to be available regarding commercial versus "handmade" cigarettes, whether filtered or unfiltered. All smoking habits should be considered equivalent in terms of cancer risk screening additional research assesses these variables. As the DHHS article (above) points out, the greatest odds for the development of oral cancer is when patients are heavy smokers and heavy drinkers. Use of these products appear to act synergistically to substantially increase the risk of cancer. Two viruses, suspected of interacting with oncogenes and tumor suppressors, have been implicated in the etiology of oral cancer: human papillomavirus and herpes simplex virus. The isolate HPV-16 and HPV-18 have been indentified in squamous oral carcinoma. Cancer in which the virus has been isolated appears to have a better prognosis than that associated with tobacco or alcohol use. [8, 9] Herpes simplex viral nucleic acids have been isolated from lip cancer cells, and when HSV antibodies are elevated together with smoking, an increased cancer risk may exist. The Epstein-Barr herpes virus has also been linked to oral cancer. Other factors in the history that should be included in cancer screening include immunocompetence, diet, and the use of mouthwash. Suppression of the immune system resulting from HIV or non-Hodgkin lymphoma has been reported in relation to oral cancer. A number of dietary factors have been suggested as important in the etiology of oral cancer. Betel quid chewing has clearly been shown to increase cancer risk. Several studies suggest that a low intake of fruits and vegetables may increase the risk of oral cancer. Low levels of vitamin C may increase the risk of cancer in the oral cavity. Squamous cell carcinoma manifests in various red/white color configurations and surface textures. Tissue may appear red (erythroplakia or erythroplasia), red and white (patchy erythema), or white (leukoplakia). The surface mucosa may be flat, slightly raised as a plaque, stippled or corrugated, or eroded and ulcerated. A cardinal feature of neoplasm is failure to heal with conservative management. See images below. This image shows scattered red and white patches, some of which are thick, with inflammation of the underlying mucosa. The lesion is an example of leukoplakia. In cases in which the tumor is poorly differentiated, regional cervical lymph node involvement occurs. Thus the submaxillary, superficial, and deep cervical nodes should be palpated. Involved nodes are firm, nonmobile, and fixed to the adjacent structures; and they will be painless. In advanced cases with metastases, distant tumor sites can include the lungs, bone, and liver. A number of oral conditions are considered to be precancerous. Bouquot et al provide a good overview of the potential for conversion of these lesions. Those considered the most likely to convert to squamous carcinoma include erythroleukoplakia, granular leukoplakia, laryngeal keratosis, actinic cheilosis, and syphilitic glossitis with dorsal leukoplakia. Smooth and thick leukoplakia, smokeless tobacco keratosis and the erosive form of lichen planus have also been linked to neoplastic conversion. The problem that presents itself with evaluation of these various conditions is that when they are large, one part may be normal while another section involved and biopsy may be negative if it is not taken in the abnormal area. Imaging can be useful for lesions involving the attached alveolar gingival as the underlying bone may be involved. Plain film imaging is not considered particularly accurate for assessing bone involvement but CT scanning and, more recently, cone beam CT (CBCT) has been recommended for assessing cancer involving the bone. MRI should be pursued for lesions involving the tongue and other intra-oral soft tissues. A number of new methods and technologies that aid oral cancer screening have been developed. These strategies are particularly useful for assessing large lesions, where the area of involvement is unclear and where secondary sites might be involvement. [17, 18] Limitations are described below. Numerous articles and web sites describe toluidine blue (TB) as an adjunctive screening technique for oral cancer. Patton, Epstein, and Kerr provide a thorough review of the literature and meta analysis of the research assessing the PPV, sensitivity and specificity of the technique. For their review, 15 studies met the inclusion criteria. Several studies assessed the technique in low-risk populations, one in patients with prior treatment for cancer, and 8 studies looked at its use in subjects with suspicious lesions or histologically proven dysplasia or cancer. Most were prospective case series, and one study was a prospective longitudinal study. Taken together, 2,400 lesions had been stained using TB. The standard technique for applying 1% TB includes a prerinse with a 1% acetic acid solution, application of TB by mouthrinse or topical swab, and a postapplication rinse with 1% acetic acid. The chemical stains nucleic acids and produces a variable blue color, marking abnormal tissues. In the Patton review, when studies with low-quality ratings were excluded, the sensitivities of TB as a diagnostic adjunct varied from 38-98% and specificity from 9-93%. The positive predictive values (PPV) ranged from 33-93%. Several products on the market use the above tissue reflective based systems for cancer screening in the oral cavity. 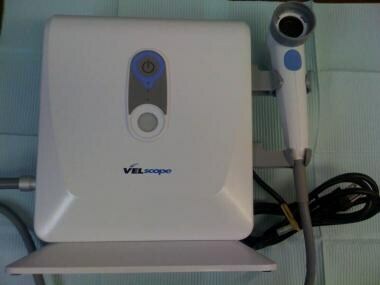 These include the ViziLite System (see first image below), MicroLux DL system, the Orascoptic DK system, and the VELscope system (see second image below). The patient first rinses with 1% acetic acid, which is followed by direct visual inspection using a blue-white light source. This illumination of the tissues causes abnormal tissue to be disclosed as white, while normal tissue will be bluish white. Toluidine blue can also be used to augment the technique. Lingen et al provides a critical assessment of these diagnostic systems. The authors conclude that supportive evidence is sparse and diagnostic advantage over standard inspection may be limited. Whether these techniques help to define precancerous lesions that cannot be seen with incandescent light remains unclear, but, should this be the case, the technique may prove beneficial. A more recent 2008 review of the ViziLite system by Patton et al revealed inconsistent accuracy values with 0-14% specificity and PPVs of 18-80%. When one of the studies was eliminated because of a low quality rating, the analysis from the remaining 2 studies was consistent but disappointing: 0% specificity, 20% PPV, and 0% NPV. 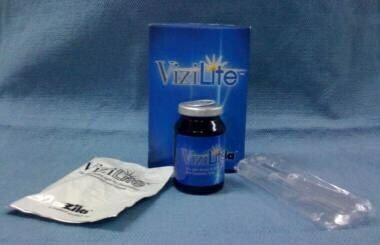 ViziLite is now available as a kit with TB swabs. Two studies assessing this strategy suggest that the addition of the toluidine blue improved the specificity and PPV and increased the NPV to 100%. Visual examination was significantly enhanced. The VELscope is another light-based technology using fluorescence provided via a halide lamp for visualization. Lighted tissue emits a green fluorescence and it is the difference in the degree of green that is reported to reveal abnormality. Dark green to rust is thought to demonstrate abnormal tissue while normal tissue appears a pale lime green. There is no pre-rinse with this system and TB is not utilized. Two other studies of the VELscope from researchers at the same center report sensitivities of 98-100%, specificity of 78 and 100%, PPV of 100 and 66%, NPVs of 86 and 100%. [25, 26] . 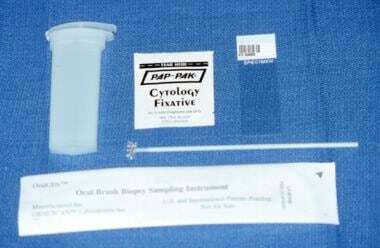 The role of brush biopsy and DNA cytometry for screening oral cancer is reviewed by A Bocking, et al in their article published in the Journal of Oncology, 2011. The authors point out that while biopsy is considered the criterion standard, exfoliative cytology may be useful in the screening of preneoplastic lesions such as leuko-/erythroplakias and lichen ruber (eg, lichen planus, verrucous leukoplakia, erythroplakia). The limited studies assessing this diagnostic screening technique are with sensitivities from 71-100%, specificities from 27-94%, PPVs from 38-88%, and NPVs from 50-100%. The data from these and other studies suggest that false-positive findings may limit the utility of this screening technique. Accuracy of the test may be related to lesions that have already been assumed to be suspicious based on visual inspection. However the manufacturer of the test suggests that it is not intended to be used to assess suspicious lesions (as well as fibromas, mucoceles, or pigmented lesions –class 1 lesions). The benefit of the system is that it is relative non-invasive. The technique itself involves scraping the mucosa (a rotation with firm pressure 5-15 times) with a provided brush with the collected tissue then placed on a slide, fixed, and sent to the OralScan Lab for evaluation by a pathologist. See images below. Firm, circular rotation of the head of the supplied brush is performed over the surface of an alteration on the ventral part of the tongue. Contents of the diagnostic kit include the sterile circular brush, a barcode-labeled slide, a fixative pouch, and a plastic transport container. Also included is a history form with a barcode corresponding to that on the slide and a prepaid Express Mail container. Brush biopsy has been combined with a technique that assesses biomarkers and peptide profile patterns from the provided sample by means of ‘matrix-assisted-laser-desorption/ionization-time-of-flight-mass-spectrometry (MALDI-TOF-MS). [30, 31] . Brush biopsies from 27 patients with proven squamous cell carcinomas were compared with 40 biopsies from 10 healthy controls. Analysis suggested that the technique could distinguish between health patient tissue and that with cancer with a sensitivity of 100% and specificity of 93%. Additional validation trials are planned to assess its screening potential for pre-symptomatic head and neck cancerous lesions. Other molecular markers such as podoplanin expression, serine protease inhibitor, clade B, P1N1, a prolyl isomerase which regulates phosphorylation, HIF-1a (hypoxia-inducible factor-1a, and other cellular markers may, when combined with brush biopsy, prove helpful in screening for oral cancer. DNA cytometry, a technique that has been used to differentiate keratoacanthomas from squamous cell carcinoma of the dermous  has also been combined with brush biopsy in assessment of oral leukoplakia for prediction of oral dysplasia. 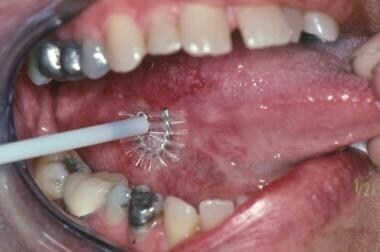 Sensitivity and specificity has been estimated to be 100% when combined with oral brush biopsy. Another technology that shows promise in detecting oral cancer is microscopy or stereo-optical microscopy. This system takes advantage of capillary changes that precede tumor growth and the patterns that these vessels make in the growth process. However at present the costs of using such instrumentation place its use at a disadvantage. Tissue biopsy remains the criterion standard for oral cancer screening. The one disadvantage of this assessment strategy is that its accuracy may be limited for large lesions, dysplastic or pre-malignant lesion, or when there has been field cancerization. American Cancer Society. Oral Cavity and Oropharyngeal Cancer. American Cancer Society. Available at http://www.cancer.org/cancer/oralcavityandoropharyngealcancer/detailedguide/oral-cavity-and-oropharyngeal-cancer-key-statistics. January 27, 2016; Accessed: February 18, 2016. Burgess J. 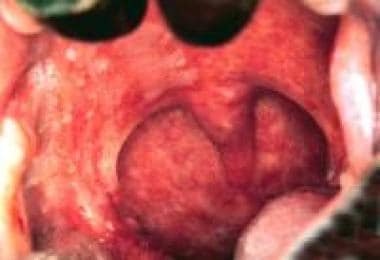 Painful Oral Lesions: what to look for, how to treat, Part 1. Consultant; 46(13), 2006. American Cancer Society. Survival rates for oral cavity and oropharyngeal cancer by stage. American Cancer Society. Available at http://www.cancer.org/cancer/oralcavityandoropharyngealcancer/detailedguide/oral-cavity-and-oropharyngeal-cancer-survival-rates. January 27, 2016; Accessed: February 18, 2016. US Department of Health and Human Services. Reducing the health consequences of smoking: 25 years of progress. A report of the Surgeon General. Atlanta : US Department of Health and Human Services, Public Health Service, Centers for Disease Control, National Center for Chronic Disease Prevention and Health Promotion, Office on Smoking and Health, 1989. DHHS publication no. (CDC) 89-8411). Asakge T, et al, Genetic polymorphisms of alcohol and aldehyde dehydrogenases, and drinking, smoking and diet in Japanese men with oral and pharyngeal squamous cell carcinoma. Carcinogenesis 2007, 28:865-874. Hirake A, et al, Gene-gene and gene-environment interactions between alcohol drinking habit and polymorphisms in alcohol-metabolizing enzyme genes and the risk of head and neck cancer in Japan. Cancer Sci 2007. 98:1087-1091. St Guily JL, et al. Human papillomavirus genotype distribution in oropharynx and oral cavity cancer in France – The EDiTH VI study. J Clin Virol. 2011; 51(2):100-104. Ang KK, et al. Human papillomavirus and survival of patients with oropharyngeal cancer. N Engl J Med. 2010; 363:24-35) (Gillison ML. HPV and prognosis for patients with oropharynx cancer. Eur J Cancer. 2009; 31:1393-1422. Gillison ML. HPV and prognosis for patients with oropharynx cancer. Eur J Cancer. 2009 Sep. 45 Suppl 1:383-5. [Medline]. Shillitoe EJ. The role of viruses in squamous cell carcinoma of the oropharyngeal mucosa. Oral Oncol. 2009; 45:351-355. McLaughlin JK, Gridley G, Block G. Dietary factors in oral and pharyngeal cancer. J Natl Cancer Inst 1988;80:1237-43. Warnakulasuriya S, Fennell N, Diz P, Seoane J, Rapidis A. An appraisal of oral cancer and pre-cancer screening programmes in Europe: a systematic review. J Oral Pathol Med. 2014 Oct 25. [Medline]. Brocklehurst P, Kujan O, O'Malley LA, Ogden G, Shepherd S, Glenny AM. Screening programmes for the early detection and prevention of oral cancer. Cochrane Database Syst Rev. 2013 Nov 19. 11:CD004150. [Medline]. Oral Cancer Technology Review. Available at http://www.fightoralcancer.org/wp-content/uploads/pdf/OralCancerTechnologyReview.pdf. Closmann J and Schmidt B. The use of cone beam computed tomography as an aid in evaluating and treatment planning for mandibular cancer. J of Oral and Maxillofac Surg. 2007, 65(4): 766-771. Jitender S, Sarika G, Varada HR, Omprakash Y, Mohsin K. Screening for oral cancer. J Exp Ther Oncol. 2016 Nov. 11 (4):303-307. [Medline]. Shashidara R, Sreeshyla HS, Sudheendra US. Chemiluminescence: A diagnostic adjunct in oral precancer and cancer: A review. J Cancer Res Ther. 2014 Jul-Sep. 10(3):487-91. [Medline]. Sahebjamee M, Mansourian A, Etemad-Moghadam S, Shamshiri AR, Derakhshan S. Conventional versus Papanicolaou-Stained Cytobrush Biopsy in the Diagnosis of Oral Squamous Cell Carcinoma. Oral Health Dent Manag. 2014 Sep. 13(3):619-22. [Medline]. Patton L, Epstein J, and Kerr R, Adjunctive Techniques for oral cancer examination and lesion diagnosis. J Am Dent Assoc, 2008, 139(7):896-905. Gray M, Gold L, Burls A, Elley K. The Clinical Effectiveness of Toluidine Blue Dye as an Adjunct to Oral Cancer Screening in General Dental Practice: A West Midlands Development and Evaluation Service Report. Birmingham, England: Development and Evaluation Service, Department of Public Health and Epidemiology, University of Birmingham. Ohnishi Y, Fujii T, Ugaki Y, Yasui H, Watanabe M, Dateoka S, et al. Usefulness of a fluorescence visualization system for the detection of oral precancerous and early cancerous lesions. Oncol Rep. 2016 Jul. 36 (1):514-20. [Medline]. [Full Text]. Lingen MW, Kalmar JR, Karrison T, Speight PM. Critical evaluation of diagnostic aids for the detection of oral cancer. Oral Oncol. 2008 Jan. 44(1):10-22. [Medline]. [Full Text]. Oral Cancer Diagnostic Technologies. Available at http://www.cdha.org/downloads/ce_courses/homestudy_Oral_Cancer_Diagnostic_Technologies.pdf. Poh CF, Zhang L, Anderson DW, Durham JS, Williams PM, Priddy RW, et al. Fluorescence visualization detection of field alterations in tumor margins of oral cancer patients. Clin Cancer Res; 2006;12(22):6716–22. Lane PM, Gilhuly T, Whitehead P, et al. Simple device for the direct visualization of oral-cavity tissue fluorescence. J Biomed Opt 2006;11(2):024006. Poh CF, Zhang L, Anderson DW, et al. Fluorescence visualization detection of field alterations in tumor margins of oral cancer patients. Clin Cancer Res 2006;12(22):6716–6722. Chang CJ, Wilder-Smith P. Topical application of photofrin for photodynamic diagnosis of oral neoplasms. Plast Reconstr Surg. 2005 Jun. 115(7):1877-86. [Medline]. Leunig A, Rick K, Stepp H, Gutmann R, Alwin G, Baumgartner R, et al. Fluorescence imaging and spectroscopy of 5-aminolevulinic acid induced protoporphyrin IX for the detection of neoplastic lesions in the oral cavity. Am J Surg. 1996 Dec. 172(6):674-7. [Medline]. Bocking A, et al, Role of Bursh Biopsy and DNA cytometry for prevention, diagnosis, therapy, and followup care of oral cancer, 2011, J Oncol. Remmerbach tW, et al, Oral brush biopsy analysis by matrix assisted laser desorption/ionization-time of flight mass spectrometry profiling-a pilot study. Oral Oncol. 2011; 47(4):278-281. Liu Y, Tan YR, Sun WW, Ju WT, Fu Y, Wang LZ, et al. Identification of SCARA5 as a potential biomarker for oral squamous cell carcinoma using MALDI TOF MS analysis. Proteomics Clin Appl. 2018 Feb 20. [Medline]. Kaur M, Handa U, Mohan H, Dass A. Evaluation of brush cytology and DNA image cytometry for the detection of cancer of the oral cavity. Diagn Cytopathol. 2016 Mar. 44 (3):201-5. [Medline]. Maraki D, Becker J, Goecking A. Cytologic and DNAcytometric very early diagnosis of oral cancer. J Oral Pathol Med 2004, 33:398-404. Chiew W.M. et al, Online volume rendering of incrementally accumulated LSCEM images for superficial oral cancer detection. World J Clin Oncol, 2011. 2(4):179-186. Allison P. Effectiveness of screening for oral cancer not proven. Evid Based Dent. 2004. 5 (2):40-1. [Medline]. Herzberg A, et al, DNA image cytometry of keratoacanthoma and squamous cell carcinoma. J of Invest Derm 1991, 97:495-500. Sciubba JJ. Oral cancer. The importance of early diagnosis and treatment. Am J Clin Dermatol. 2001. 2(4):239-51. [Medline]. Oral Cancer Screening Aids. Available at http://www.oralcancerfoundation.org/dental/pdf/Oral_Cancer_Screening_Aids.pdf.